Advocaat resembles eggnog. However, Dutch advocaat is thicker and creamier. It is poured into small glasses and eaten with a teaspoon. Even though advocaat and eggnog are made with the same ingredients, they are a world apart. Eggnog is liquid and frothy whereas Dutch advocaat is a creamy blend of egg yolks, sugar, vanilla and brandewijn. Advocaat is an old-fashioned drink and associated with grandmothers and the old days. It is the often first alcoholic drink Dutch children taste. If you want to make your own advocaat and you don’t live in the Netherlands, you have a bit of a problem. The main ingredient of advocaat is brandewijn. Brandewijn is a white liquor with an alcohol percentage of at least 45% and generally not available outside the Netherlands. Some English – Dutch dictionaries translate brandewijn as brandy but the correct Dutch translation for brandy is cognac. If all this is a bit confusing, simply follow the instructions below. Vodka can be used instead of brandewijn. 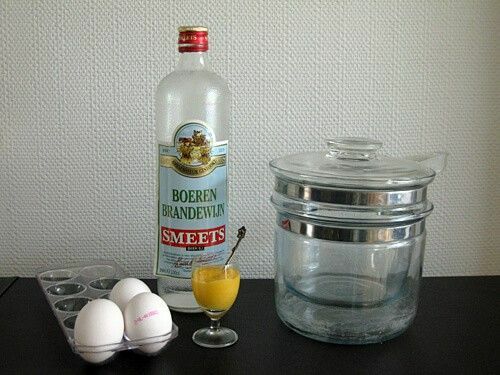 The method used to make your own advocaat is au-bain marie so that the egg mixture won’t curdle. You need a double boiler and if you haven’t got one use a small saucepan and a heat-proof bowl that rests on the brim of the pan. Fill the saucepan with water. Bring the water to the boil, lower the heat and put the little bowl with the advocaat ingredients on top. If you can’t get brandewijn, you can use vodka instead. Don’t use gin or brandy, because they have a distinct flavour which makes your advocaat taste completely different from Dutch advocaat.